I don't really get political here. Anyone who knows me knows I'm somewhere in the left-leaning moderate range, and I won't actively pretend I'm not that... but at the same time, I don't really make too many political statements in general. I don't tend to get worked up over things and feel a need to march over here and make some sort of statement. More often than not, someone else with a larger platform has already said it better, so there's not a whole lot of point to me adding my voice to the chorus. Mind you-- this is a privilege. I have the privilege not to care so much to make a fight. I know plenty of people whose lived reality means they have to make the fight. But I sometimes like a good political argument. I have a few friends on Facebook and such who lean in the other direction-- some vociferously so-- and when they post something I consider ridiculous, I'll roll up my sleeves and go in there. But mostly because I enjoy the spar. I never question their right to their opinion or their value as a member of society for holding it. Because, as much as I disagree, then one thing I never want to do is shut them up. I lead off with this, because I often find that the "win condition" most people have, on both extremes of opinion, is that the other side will just slink away and shut up. Yes, I know, the "both sides do it" is something of a lame trope in and of itself, but the overarching theme of "we're right, and those idiots are wrong, and when will they figure it out or shut the hell up?" is common to both of them. Both on the left and the right I see people go into narrower and narrower spirals of People Who Think Different Than Me Are Idiots, and nothing good comes from that. This is the result of bubbling yourself in an echo chamber. Part of why I don't want my conservative friends to shut up and go away-- besides the fact that they're friends-- is I do not want the echo chamber. Silencing opposing views just makes all of us weaker. I always love the quote Aaron Sorkin liked to re-use in several of his works: "If you're dumb, surround yourself with smart people. If you're smart, surround yourself with smart people who disagree with you." To wrap this back around to writing-- you need to have other viewpoints in your life to understand them and write from them. If you shut that out, it'll be reflected in the work. Then you get books that are screeds and message laden. Flawlessly right heroes and cardboard villains whose main plan is "be stupid". How is this interesting? Well, from what I've seen, that sort of thing is interesting to people in the same echo chamber. And if you want to write that story, power to you. I'm not interested. When I drafted The Way of the Shield-- a book filled with Maradaine politics-- one of the points I felt I needed to hit was to understand everyone's point of view and write it as legitimate when I was writing in their voice. An early version fell apart because I wasn't taking my villain seriously. Understanding the work beyond my own comfort zone was what allowed me to make that work. So, I'll argue, if I feel like jumping in there. But I never want the opposition to go away. Where's the challenge in that? Speaking of challenge, I've been puttering away at Thorn III and a few other projects, and I need to be getting back to that. I just sussed out a pacing/timing issue I was having on Thorn III, so I'm eager to get to the details with that. See you down in the word mines. Today I'm in the kitchen doing all sorts of things-- if you've read my books it probably does not surprise you that I'm into food and I'm the primary cook in the house. I remember when I read The Omnivore's Dilemma, one "rule" he puts in there to maximize your "healthy" eating is, "you can eat anything that you make from scratch", and I though, "this does not limit me much". In fact, I'll cop that I'm something of a food snob. I've made a point of including food in all my work, because food is culture, food is worldbuilding. I've made a point of highlighting how Druthal has many different regional cuisines. But what books have gotten my appetite going? I'll have to confess, it doesn't happen very often. See above: something of a food snob. At least, it doesn't happen with fiction. Foodie memoirs, like Anthony Bourdain's Kitchen Confidential or Gabrielle Hamilton's Blood, Bones and Butter? Yeah, those got me inspired to go down to the kitchen and getting to work. I can think of one example though. While I'm a food snob, my snobbery leans toward rustic simplicity. There's a passage in David Eddings's Polgara the Sorceress, the second sort-of-prequel to the Belgariad, where Polgara decides that Faldor's Farm (where the Belgariad begins) is the place she's going to settle down for a bit to raise Garion, and thus she's going to take over the kitchen. The former head of the kitchen was an incompetent drunk, and Polgara has to "audition" to take over with minimal time and mostly force of personality (which Polgara has in spades). So she whips together a vegetable stew and biscuits, which the farmhands-- having not had a decent-tasting meal in months-- eagerly consume every last drop of. I felt like going down to the kitchen and making a stew after that. All right, I've got a full day of kitchen ahead of me now, so I'm off. Hope your days are filled with joy and delicious things. It's no secret that I've had a very good 2015. Two books came out, to solid reviews and decent sales. Even made the Locus Bestseller List one month. No, that's not happening. Not yet. And that's all right. Because as far as having a solid launch for a long literary career goes? I feel like I'm in a great place. I've done hard work and had good fortune, and this is the result. I am so grateful for the opportunity to do this. The opportunity to write and tell these stories. To be able to bring Veranix, Satrine and Minox and all the rest of Maradaine into the world for you. This is the dream I'm living now, and it's thanks to my family, friends and readers like you that I get to do this. Next year, with The Alchemy of Chaos and An Import of Intrigue coming out, I'm only building on the good fortune I've already received. And I have so much planned for you all, and I'm thrilled to be able share it with you. I'm not much of one for simple quotes of advice on writing craft. Part of the reason for that is it's not that simple. It's about doing the work, the hard work, to get it done. But, if you want quotes, if you want some of the things that ring in my head about doing the work, it's better for you to hear them. The basics what they're all saying: Do the work. Keep doing it. It will not be easy. Put in the hours. There's not a writer worth the ink their work is printed on who will tell you this is some easy lark. Anyone who does is selling something. There are tools to help improve, there is mastery of the craft, but all that comes from just planting yourself in front of your writing implement of choice and working at it. I joke about "going down to the word mines", but it helps to keep that frame of mind that it's a process of work and effort, and it shouldn't be taken lightly. You know, if you had asked me in 2005, I would have said that I absolutely, definitely was ready for publication. Sure, maybe my work needed some fine-tuning-- or straight up "getting done", but I thought that I was fundamentally there. Well, this weekend I pulled out a short story I had written around 2005. I'm not sure exactly when I wrote it, but I think it was around then. To my memory, I wrote it while I was still working in the English department, a job I left in January 2006, and I think I wrote it after attending my first ArmadilloCon Writers' Workshop, which was in July or August of 2005. This makes sense, because I would have gotten the idea in my head that A. my perennial work-in-progress at the time, the long-since-trunked Crown of Druthal, was not the slam-dunk I thought it was going to be at the workshop and B. that I needed to try to write short stories. So the short story in question was to be the first of several character-study-shorts focusing on one of the characters from Crown of Druthal. I had the intention of doing more, but that never materialized. But back to this piece: at the time, I really thought I had something solid. I put it to critique. I shopped it around. I thought, fundamentally, that I was ready to get things moving. But, like I said, I pulled it out this weekend to look it over-- I wanted to refresh myself on the ideas in the story, mostly for parts to cannibalize for something else brewing in the back of my skull. It was rather poor work. It's not BAD, but it's the sort of thing that, if I received it for the Writers' Workshop, I'd give it a B- or C+, in part because the sentences are so clunky. The story trying too hard and failing miserably. Plus the climax is RUSHED because I needed to get a lot of things out and keep it under 5000 words, because SHORT STORY. A. Don't write short stories just because 'you ought to'. Write them because they're the natural fit for the story you're telling. There's no other reason to write a short story. B. At the time, I really thought this story was Good Stuff. Now I see how weak it really was. My writing craft still needed a lot of practice to get to the point where what I was writing was publishable. I couldn't see that then, but it's clear to me now. If you're thinking about self-publishing, that's a good thing to keep in mind. Consider putting something to the side for a bit-- not ten years, but a bit-- and then look at it with fresh eyes before you press "publish". 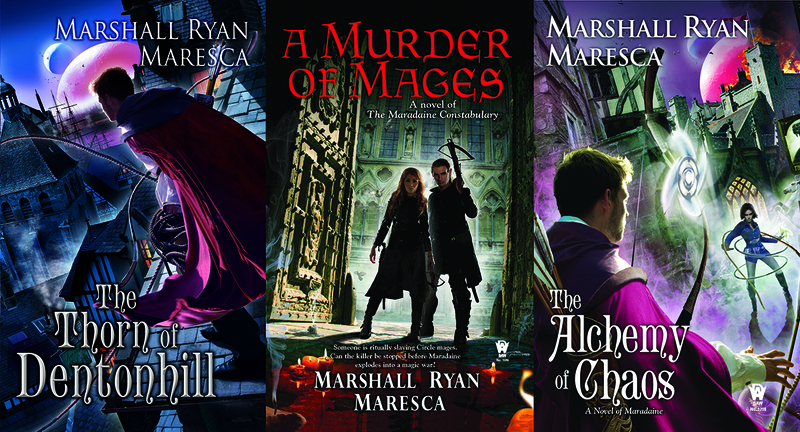 I've been ridiculously happy with the covers I've had so far for the Maradaine books. I think they really capture the feel of the books and do an excellent job drawing reader attention. Paul Young has done right by me here. You look at the Thorn cover, and you know you're going to get a city-based adventure in a fantasy setting, one that involves a rooftop-running, nighttime focused hero. 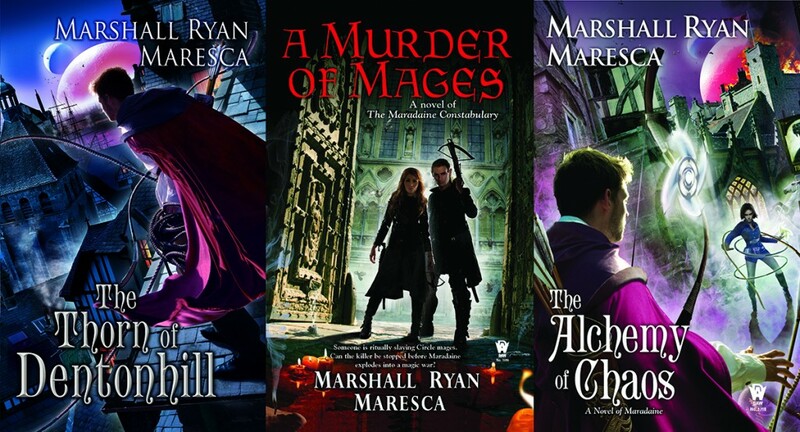 You look at the Murder cover, and you know you're going to get something involving gruesome murders and two heroes who are equal partners. 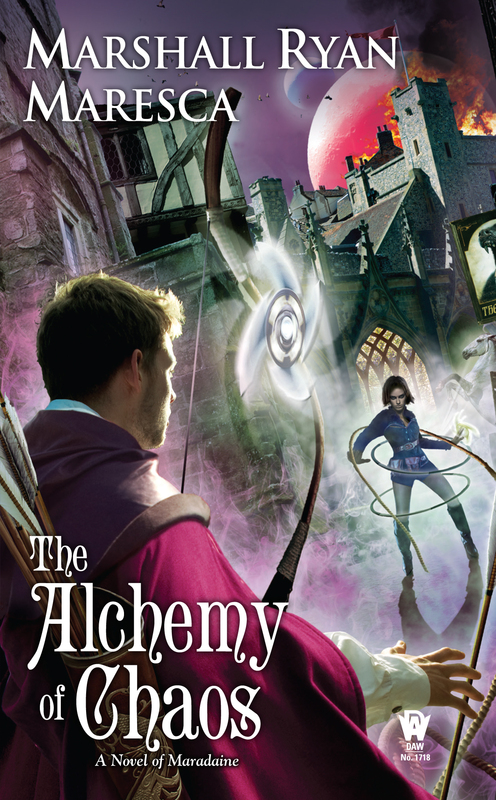 So, what do you see in the Alchemy cover? Beyond the obvious "this is a sequel to Thorn", since he and the two moons are prominent again. None of these new writers are any damn good. I haven't read anything written since 1975." Now it may be said commentator was eliding a key point; they may have meant they haven't read anything worth reading, for example. But the underlying point is still just as absurd: that nothing new is good, and the reader hadn't bothered really exploring it. There's is a school of thought among the SFF fans that the classics are all that's worth a damn, and if you don't read those you aren't a real fan. This is true, especially, when you look at this idea the simmered under all the Hugo controversy, where some were essentially saying, "The old Hugo winners were these timeless classics, and in recent years it's new stuff I haven't heard of." It's an aversion to not only new work but new people in the field, which also has elements of racism and sexism tied to it. I've been seeing this for a long time, so while I don't know what specifically sparked this rant by Jason Sanford, I'm utterly unshocked by the idea that he came across something which did. That said, I'm not all in with Sanford. He talks about SFF Lit being thriving and vibrant-- which is totally true. We've "won", in the sense that we've gone fully mainstream. The SFF section of the bookstore is no longer so dusty corner in the back with one shelf's worth of the same set of books. We've got a generation of writers who grew up with that shelf and were so hungry for more stuff that they've made banquets of it. But then he takes a left turn, saying, "Indie publishing is one of the few reasons SF/F literature still has a slight heartbeat." So, first off, is it thriving ("Science fiction & fantasy has conquered the world. "), or does it only have a "slight heartbeat"? It feels like this comment runs contrary to everything else he said. More to the point, how is he defining "indie publishing"? Is he talking about self-publishing, or small presses, or what? But even past that, this strikes me as yet-another-backhanded swipe at traditional publishing, like it's one of those dinosaurs he complains about arguing about which classics are best. That traditional publishing isn't interested in new voices, ideas or work. Even a cursory glance at the output of the traditionally published SFF of the past year shows that isn't the case. Just this far-from-complete list at The Qwillery shows over 60 new authors from this year alone. That's a lot of new work from new voices from a genre that only has a "slight heartbeat". And, yes, for full disclosure, I'm included in that list. Now, I won't knock on the "classics" themselves. I read them, if asked I'll recommend them, especially if I'm explicitly talking about SFF Lit from a historical perspective. But at the same time, they aren't what I'm reading right now, and they are not on my go-to list of what I will recommend to people interested in the genre. If someone wants a foothold into the genre, I'm far more likely to push Lies of Locke Lamora at them over The Lord of the Rings, and Old Man's War over Starship Troopers. And I, for one, am dying to know who among my peers is going to be the Next Classic.